Nasma Residences ... an Arada project. UAE’s newest developer Arada says it is launching the second phase of Nasma Residences after unprecedented buyer demand for the Sharjah residential community resulted in the first phase selling out ahead of schedule. Nasma Residences offers a superior location in the heart of new Sharjah, at the intersection of Emirates Road Highway 611 and Maliha Road, adjacent to the newly developing Tilal City, Tilal Mall and the new state-of-the-art Sharjah Convention Centre. 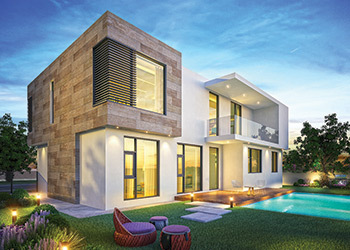 As part of Phase Two, Nasma Residences’ five-bedroom Signature Villa will also be available for purchase for the first time, in addition to the two- and three-bedroom townhouses, and four-bedroom semi-detached villas already on offer. Arada has also confirmed that construction on the community’s shopping centre, Nasma Square, will begin in July. The 6,500-sq-ft mall will feature a large-scale anchor shopping experience, complemented by casual dining outlets. With Phase One scheduled for completion in late 2018, Nasma Residences will feature a total of more than 800 contemporary villas and townhouses, delivered over four phases, as well as a host of community facilities in the heart of a vibrant cultural and business hub. Azizi Developments has announced the launch of its latest residential development, Azizi Aura, which offers studios, one- and two-bedroom apartments with luxury hotel facilities in the prime Jebel Ali area of Dubai, UAE. Centrally located with convenience in mind, Azizi Aura is in close proximity to Dubai Marina, offering easy access to Sheikh Zayed Road and Mohammad Bin Zayed Road, says the developer. Aura rises up 17 floors and is home to 346 elegant residential units, it stated. The apartments of the complex vary in size and shape with 191 studios, 124 one-bedroom flats and 23 two-bedroom units making up the count. Azizi Developments says all the apartments have been designed with residents in mind. Inspired by European craftsmanship, the colours and mood of each unit reflect the warmth of a home that is cozy, elegant and aesthetically pleasing, it states. With masterful finishing and beautifully intricate designs, Aura offers comfort and luxury through key amenities such as landscaped gardens, gymnasium and swimming pool apart from retail areas and covered parking. The units are elegantly decorated with marble flooring, ample counter space and mesmerising wall and ceiling detail. Eaton Place ... serene community living. Construction at the new Eaton Place project at Jumeirah Village Circle (JVC) in Dubai is progressing rapidly, according to the UAE-based Ellington Properties. A Dubai-born design-led boutique property development company, Ellington Properties is a major developer of bespoke and beautiful high-quality homes. 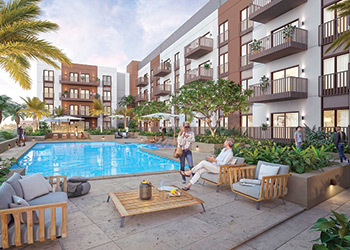 Eaton Place, which has been designed for community living, offers a collection of studios, one- and two-bedroom units overlooking a resort-style pool courtyard. “As a design-conscious property developer, Ellington offers a wide assortment of bespoke properties for discerning customers. Having highlighted our commitment to delivery with Belgravia, commencing the construction of Eaton Place marks our focus on handover as per schedule,” says Robert Booth, the managing director of Ellington Properties. The heart of Eaton Place is the beautifully landscaped central court. Residents can get in shape at the gym and relax in the outdoor pool surrounded by lush greenery. “The interiors are serene with the concept of play on pastel neutrals inspired by the tonalities of a desert rose. Trendy colour schemes present a sophisticated and fashion-forward look; wood effect beige porcelain tiles provide texture and warmth,” explains Booth. Other interior design aspects include sintered stone counter-tops with white-marble effect and mirrored splash-backs, offset by tonal joinery. Taupe porcelain in the bathrooms creates a warm backdrop to the white ceramics and subway wall tiles, he adds. Construction work is progressing and the project is scheduled for completion by mid-2018. Aldar says it has achieved a major milestone by selling all the homes in the third tower at its latest mid-market development, The Bridges, within just four hours of its launch early last month (May 6). A 1,272-unit project, The Bridges is being built at a cost of Dh1.3 billion ($354 million) – on Reem Island in the UAE capital. It comprises six canal-side towers, of which two were sold out at Cityscape Abu Dhabi in April, according to Aldar. The Abu Dhabi developer says one tower was initially planned to be released for sale during the event, but the extraordinary response prompted the launch of another tower, and as a result the sales date for the third tower was brought forward. Prices start from Dh450,000 ($122,494), with eight different unit types offered including studios, one-, two-, and three-bedroom apartments. The developer has now generated Dh600 million ($163 million) revenue from sales across the three towers. Commenting on the record sale, Talal Al Dhiyebi, the chief development officer, Aldar Properties, says: “Demand for The Bridges has been very encouraging, reflecting customer confidence in the Aldar brand and its developments – and also the resilience of the Abu Dhabi real estate market as new and different types of products are introduced. Evo Townhomes ... targeted at millennials. 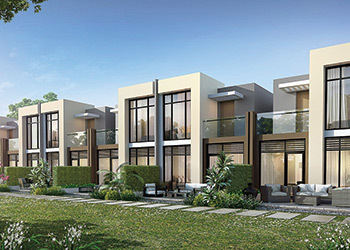 Damac Properties has launched Evo Townhomes, a range of two-bedroom homes that appeal to couples and young professionals who are in search of a revolutionary living concept. Combining both space and practicality, Evo Townhomes provide enough room to cater to the dynamic lifestyle of the modern generation. These two-bedroom townhomes are available for Dh699,999 ($190,527) payable over five years, says the Emirati developer. Featuring two bedrooms, a kitchen, a living room, covered parking and private garden or terrace, these cosy townhomes exemplify the next level in convenience and modernity. From contemporary homes to wide-open spaces, recreational activities and lifestyle amenities, there is always an array of things to see and do, it adds. Evo Townhomes, he states, break the Dubai mould as they are set within Akoya Oxygen master development, a green community that embraces tranquillity and a more leisurely way of life. UAE-based MAG Property Development (MAG PD) is expanding its presence across Dubai with the launch of two high-end developments – MAG 318 and MAG 230 – in Downtown Dubai and Dubailand. MAG PD, the property development arm of MAG Group, said the 318 tower brings high-end studios, one- and two-bedroom apartments to Downtown Dubai, providing easy access to Dubai Mall and featuring private balconies that offer spectacular views of the Burj Khalifa – the world’s tallest building. The development is enhanced by extensive landscaping, a pool, outdoor leisure spaces, a children’s area, a community centre and a coffee shop, providing residents with a fully integrated living environment that is fully walkable and in close proximity to schools, offices, hospitals, malls and hotels for maximum convenience. Residents will also have use of multiple entry and exit routes to main highways including Sheikh Zayed Road, Al Khail Road and Emirates Bypass Road. MAG 230 is a prestigious residential landmark that will be developed in the heart of Dubailand as part of the City of Arabia masterplan, a multibillion-dollar retail, residential, commercial and entertainment hub designed as a self-contained community and will be served by its own monorail system. The project is due for completion in Q4 2019 and will bring 595 new apartments to Dubai’s real estate sector.